Hola amig@s! 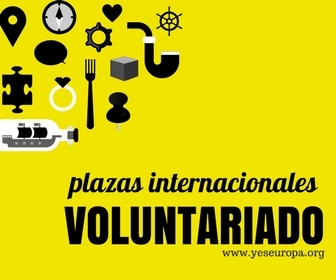 Hoy os recomendamos esta europortunidad de hacer un Servicio Voluntario Europeo en Polonia con un proyecto ya aprobado para salir en Noviembre. La entidad busca exclusivamente UNA CHICA. The project is situated within 3 city (Trójmiasto- Gdynia, Sopot, Gdańsk, north part of Poland) area, which is quite famous because of its tourist facilities. There are 3 separate flats available for EVS volunteers. In each flat are tree rooms where 3 volunteers stay so that each volunteer has got their own bedroom and share kitchen, bathroom with other EVS volunteers. The flats are situated quite close to the means of transport. The volunteers are getting ticket for the transport to get from the flat to work place. Apart from pocket money, they are getting also money for food each month. The project is about work with people with disabilities and elderly. However it’s more connected with people with disabilities unless volunteer prefer to work with elderly instead of people with disabilities. The volunteer will have the opportunity to organize, together with the group leaders working in the centres, different activities, in general connected with art. While working together with the group leader and with the disabled people the volunteer will learn how to make a basket, to learn how to paint using many different painting techniques. Besides, the volunteers will have a chance to see and use the methods of activating the elderly. The volunteer may help sometimes in moving wheelchairs, feeding people who are not able to eat on their own, assist during the physical rehabilitation.. In summer holidays the volunteer will have the opportunity to take part in different camps for children and youth – as an assistant of a group leader or a person responsible for sport and/or music activities. We go on a different kind of camps as stationery camps with children, walking tours with youth, canoe camps. We would like our volunteer to help us in all different kinds of activities such as painting workshops, drawing, singing or musical evenings, play games and other entertainments, hand-make boards for some game, weave with patients, cook simple meals, as well as work individually with those who must stay in bed. At the same time we are open for their suggestions and ideas. We are especially interested in things connected with their culture – national dances, songs, food and games for children typical for the country the volunteer comes from. Our volunteer should be an active, open-minded and creative person, who is willing to cooperate with disabled people and elderly. Who is open to new experiences, full of ideas, creative and responsible. SVE en Polonia a partir de Febrero! Vacantes SVE para Polonia a partir de Diciembre!! Last second! SVE de 9 meses en Liechtenstein!